The Cloverleaf Quasar is a single object whose image has been reproduced four times in a cloverleaf-like arrangement through a process known as gravitational lensing. The gravitational field of one or more foreground galaxies has bent and magnified the light from the quasar to produce the multiple images. The foreground galaxies are too faint to be seen in these images. One of the images (A) is brighter in both optical and X-ray light. However, the relative brightness is greater in X-ray than in optical light. 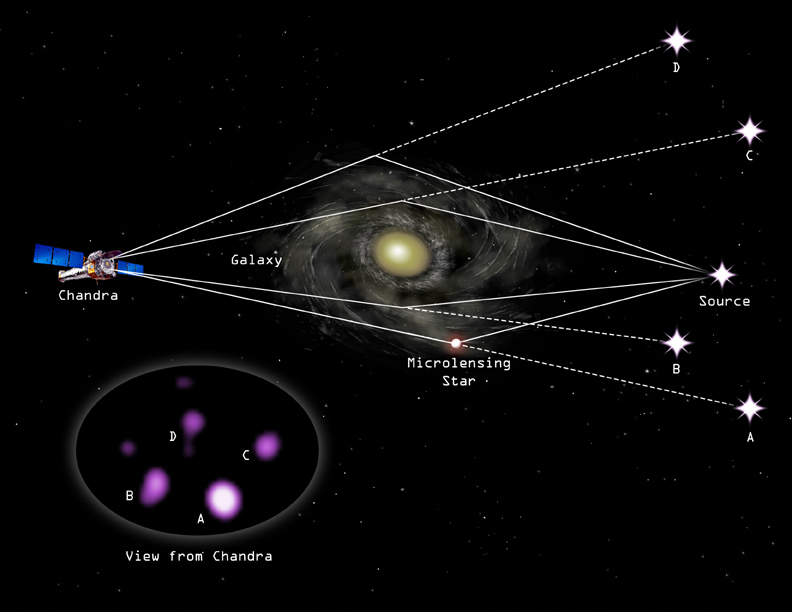 Since the amount of brightening due to gravitational lensing does not vary with the wavelength, some additional effect must be magnifying the X-rays. The increased magnification of the X-ray light can be explained if the X-rays in the Cloverleaf Quasar come from a small region around its supermassive black hole, and the optical light comes from a larger area. This could happen if a star or binary star system in one of the intervening galaxies passes in front of the region producing the X-rays. This effect is called gravitational microlensing. The Cloverleaf X-ray and optical data indicate that the X-rays are coming from a very small region, about a hundredth of a light year or less, around the supermassive black hole. The visible light is coming from a region ten or more times larger. The angular size of these regions at a distance of 11 billion light years is tens of thousands times smaller than the smallest region that can be resolved by Chandra or the Hubble Space Telescope. This discovery gives astronomers a new and extremely precise probe of the gas flow around the supermassive black hole that powers the quasar. Scale Image is 2 arcsec across. Coordinates (J2000) RA 14h 15m 46s | Dec +11° 29' 43"